Boasting more than 216 feature films from 55 countries, The Vancouver International Film Festival is one of the beefiest film smorgasbords on the circuit. It can all be a little overwhelming, but veteran critic Katherine Monk offers five vetted bets to get your cinema season started. (September 30, 2018) VANCOUVER, BC — Good news. It’s raining. So dispense with the guilt of spending long days in the dark, where the reclining stadium seats are warm and cozy and the prospect of seeing something surprising, foreign or mentally challenging is inescapable. Surrender to the cinematic urge, because the Vancouver International Film Festival kicked off Thursday with a screening of Kim Nguyen’s The Hummingbird Project and continues for the next two weeks, unleashing 216 feature films that cover the distance between Hollywood mainstream and art-house eccentricity. Those seeking an early glimpse of Oscar contenders can catch headliners such as Jason Reitman’s latest, The Frontrunner, starring Hugh Jackman as Presidential hopeful Gary Hart, or Robert Redford in The Old Man and the Gun, a heist movie with comic undertones from David Lowery. There’s no panic if you can’t make it. The big ones are all slated to open theatrically later this year, so Collette, Everybody Knows, A Private War, Boy Erased and a handful of others featuring big stars and known directors will be hitting a theatre near you. Most of the others will disappear after their brief projections, left to linger in the infinite — awaiting a streaming deal or an independent booking. Yet, so often it’s these little movies that make the festival experience what it is. They help us see from a different point of view, and frequently celebrate people who remain invisible in the frothy tides of the daily news cycle. So with the aim of helping you navigate the swirling seas of cinematic possibilities, I’ll be weighing in with a daily bet, beginning with this selection of five films that won’t disappoint. 1. Boy Erased: Joel Edgerton’s jaw-dropping second feature sneaks up on you. Based on the memoirs of Garrard Conley, the actor-director brings the true story of “conversion therapy” to the big screen and essentially forms the logical bookend to Girl, Interrupted. Jared (Lucas Hedges) is a basketball jock and son of the local pastor (Russell Crowe), but when he heads to college and becomes the target of rumour, he decides to share the doubts about his sexual orientation with his concerned parents. Edgerton captures the hushed tones of his family’s shame in every frame, and forces us to watch Jared bear the cross as he heads down his own Via Dolorosa on his way to Bible conversion camp (Love in Action, a treatment facility in Memphis). With Canadian director-actor Xavier Dolan playing one of the other patient-inmates, and Edgerton himself as the would-be drill sergeant in charge of libidos, the director creates an open canvas for Hedges to apply trembling strokes of pigment and shades of complex, emerging emotions. It’s a gorgeously subtle take on a world of black mascara and white value systems, proving Edgerton’s talent as an A-list director and reaffirming Nicole Kidman’s ability to bring warmth and humanity to characters that could easily turn into caricature. For ticket info, click here. 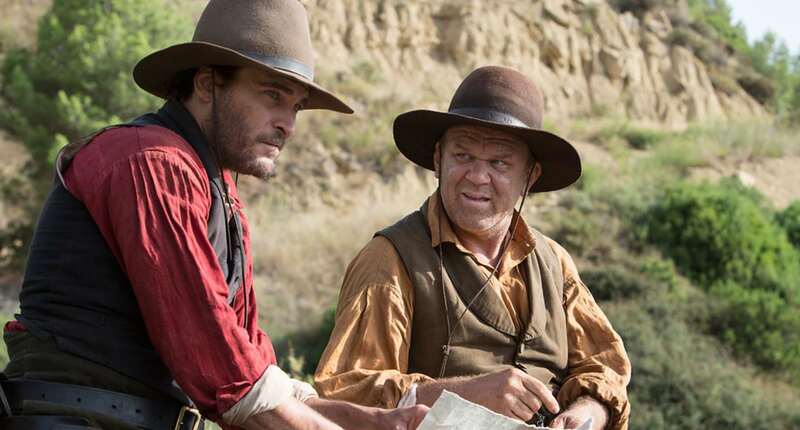 Sibling Sisters: Joaquin Phoenix and John C. Reilly star in Jacques Audiard’s latest set on the Oregon frontier. 3. Styx: Sailing stories are specific journeys of the soul. From the documentary Deep Water, about Donald Crowhurst’s failed bid to race around the world, to the recent Adrift and Robert Redford’s All is Lost, the idea of a person facing the open ocean alone offers full immersion in existential angst. It’s a genre where other people tend to represent your salvation, so a full salute to Wolfgang Fischer’s sophomore effort Styx. This movie challenges what the very idea of salvation means, and how easily a desire to help can damn us. In the opening scene, we see car accident, a random victim, and a first-responder removing the person from the wreckage. Only when we’re in the ambulance, and the camera holds on Rieke (Susanne Wolff), that we realize this is her story. She’s a helper. The next scene, she’s on her yacht Asa Gray, packing for a trip to a Ascension Island — Darwin’s “best-kept” secret: A fully artificially created eco-system designed as an experiment in the South Atlantic, 1600 km off the coast of Africa. After making it through a bad storm, she spots a crippled vessel on the horizon. It’s a trawler packed with desperate, near-death migrants. She radios for help, but when formal channels fail, she’s forced into the impossible position of putting herself in danger to help, or watching people die from a safe distance. A story of survival — at every level — Styx is definitely a voyage to the Underworld, where safe passage will probably cost you a chunk of soul. Click here for ticket information. Susanne Wolff stars as Rieke, a doctor and first-responder who finds herself in a moral dilemma in Styx, Wolfgang Fisher’s feature set on a small yacht off the coast of Africa. The Real Deal: Haida Gwaii gets its closeup in Edge of the Knife, the first-ever Haida-language feature shot on location with resident talent. 5. Le Grand Bal: When she was young, Laetitia Carton tells us she would attend an annual folk dance festival with her family. It was a place where thousands would gather to learn dance steps by day and dance all night, but the real joy was simply being in the company of others and letting the music guide your every move. This movie seeks to capture that freedom by helping us unbuckle from intellect. By merely immersing us in the surging milieu of a giant parquet in cinema verité style, Carton forces us to listen and watch. Every so often, she’ll offer a poetic voice-over, pondering the importance of seeing the world spin around you, and physically touching another human being. For the most part, the viewer is left to wander the camp site beside her, meeting generations of folk enthusiasts, watching traditional dances resurrected, and contemplating the true spiritual power of moving your body to a driving beat. (Click here for tickets). The Vancouver Film Festival runs September 27 to October 12, 2018. Please visit The Ex-Press for regular festival updates. For more information, visit VIFF.org. No Replies to "#VIFF2018: A big fattie of a film festival that will alter perception"